Inhabited by a large Maori population until around 1808 the Poor Knights Islands are steeped in history and myth. Legend tells of Chief Tatau and his warriors leaving the islands on a hunting expedition and returning to find his villages destroyed by tribes from the mainland. When Tatau returned he was met by survivors who had fled the attack. Enraged by the horrific death bestowed on his tribe, the Chief declared the islands to be strictly Tapu (spiritually restricted) and to this day no one has set foot on their shores. Interestingly, the English word ‘Taboo’ is derived from this source and is thought to have first been used by Captain James Cook during his expedition to Tonga in 1777. There are a number of theories as to where the islands picked up their name. Some say that Cook named them after the once popular British pudding the ‘Poor Knight Pudding’ that turns stale bread into a sumptuous rich desert. Others claim it is because, from a certain angle, the chain of islands looks like a knight laid asleep in the ocean. 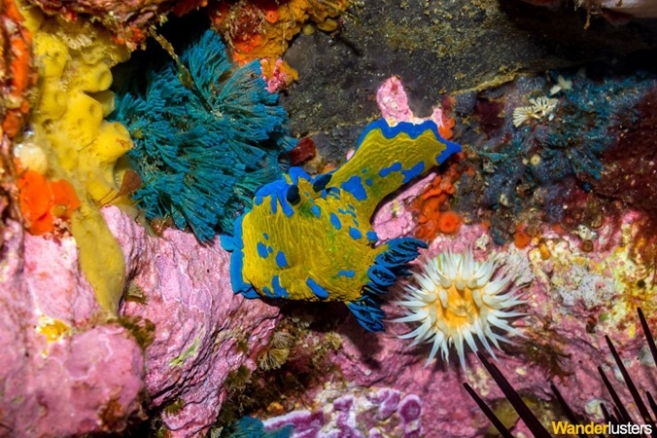 Wherever their name originates from, the islands are now known worldwide for their pristine underwater environment and rich waters, providing a diverse spectrum of life undisturbed by human influence. Established as a marine reserve in 1981 the area is fiercely protected and has captured the imagination of scuba divers all over the world. Remnants of an ancient string of volcanoes the Knights architectural beauty was sculpted during the last ice age, as water pounded the volcanic rock weaker areas collapsed forming vast sea caves, tunnels, over hangs and archways. Soaring high above sea level and plunging down to depths of over one hundred meters the rocky forms of the islands are recognised as one of the few remaining pristine ecosystems on the planet. 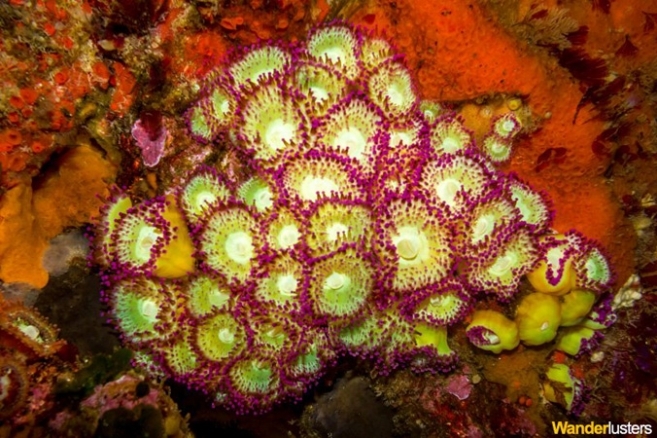 The lack of human interference here has encouraged the growth of a subtropical playground for marine and plant life, with thousands of different species taking refuge here throughout the year. 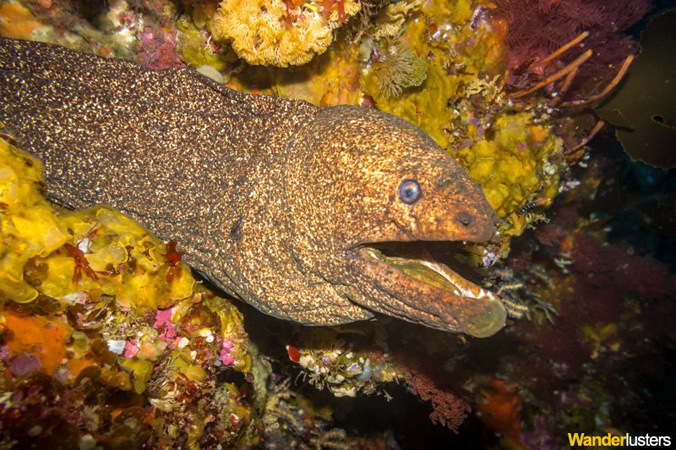 Divers have the unique privilege of being able to experience an underwater world like no other. Teaming with biomass, the area is home to countless species of fish, rays, sharks and a wealth of corals and macro life. 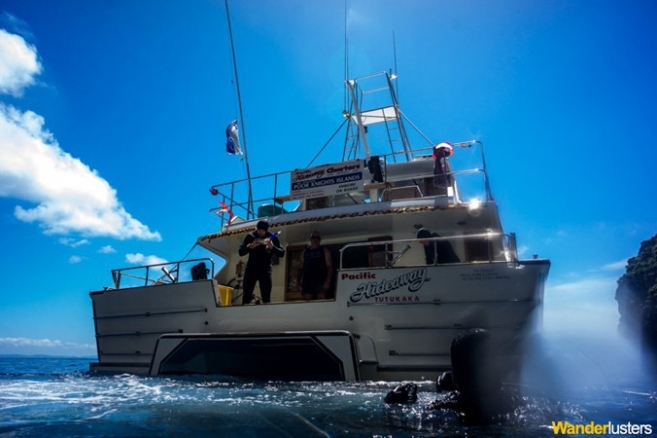 There are a number of operators offering diving packages for the area, however, we would recommend choosing one of the weekend liveaboards. Not only are they great value for money, but they allow you to fully immerse yourself in the diving experience. We chose the well run Pacific Hideaway and visited a number of sites around the islands during our trip. Boasting over fifty different dive sites, no two trips are the same, yet all just as spectacular as the last. Our trip proved no different and, although the visibility was somewhat clouded due to the seasonal algae bloom, the increase in nutrient rich water provided a greater wealth of activity among the kelp. The Lost World, Northern Arch, Taravana Cave and Landing Bay Pinnacle were all highlights of our two day trip providing a spectacular backdrop against which to spot some of the local inhabitants. The inky dark waters engendered a sense that civilisation had rewound itself, it felt as though we were diving beneath the gaze of the ancient Maori tribes who once inhabited the land above. The wealth of life was astounding, Ben and I spent at least thirty minutes at the entrance to The Lost World spotting countless species of colourful nudibranchs and throughout the weekend we spotted eagle and long tailed stingrays, mosaic moray eels, wrasse and pink and blue maomao, to name but a few. Rikoriko Cave, renowned as the largest sea cave on the planet provides a spectacular underwater environment. Bearing resemblance to the surface of the moon, much of the life in the cave has been tricked into thinking it is at much greater depths due to the lack of light. When diving here you are treated to sights usually reserved for those of a much more adventurous nature. Littered amongst the rock lay the bones of a 15m Sperm Whale. Having died out at sea it’s body was swept into the cave where it remains to this day. For divers, the opportunity to see the vast scale of the whale remains up close is incredibly rare. Using a sophisticated 3D laser scanner and traditional hydro graphic surveying techniques models have been calculated to determine the record breaking volume of the cave as 7.8 million cubic feet. Formed over ten million years ago when a gas bubble set in the lava during a volcanic eruption, the cave has played host to a number of unusual occupants during its history. In the Second World War a Japanese submarine is said to have taken refuge inside the cave while making vital repairs. 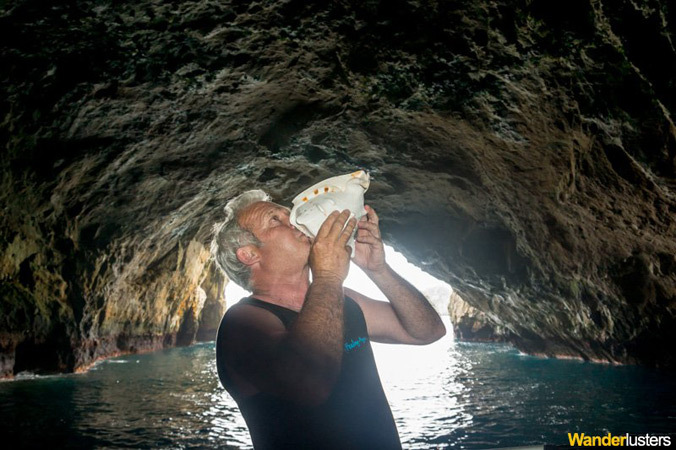 Wade Doak, who has written several books about the Poor Knights, conducted an experiment with underwater audio attracting a pod of dolphins who came into the cave to investigate further. Gregorian Chants, Maori haka challenges, opera singers, Swiss yodellers, Irish folk singers, and didgeridoo players have made impromptu performances inside. Electronic band ‘Pitch Black’ performed for the Minister of Conservation during 2003 Sea Week where there were 10 boats inside the cave with over 100 people in and under the water. Diving the Poor Knights has been an unique experience and one that we would recommend for both beginner and advanced divers. 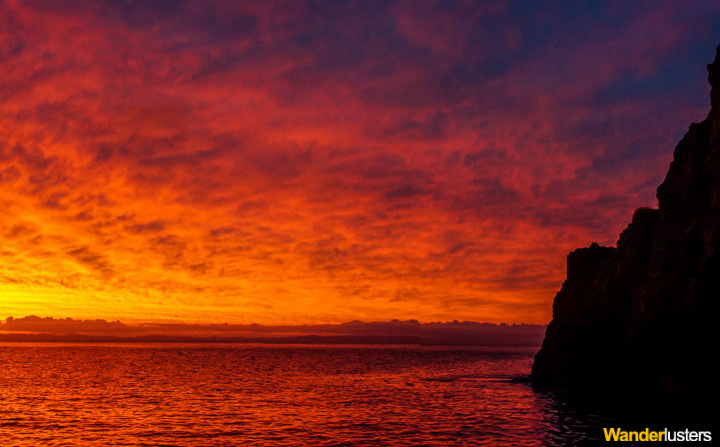 We booked our trip with Global Dive in Auckland who charter the Pacific Hideaway once a month. 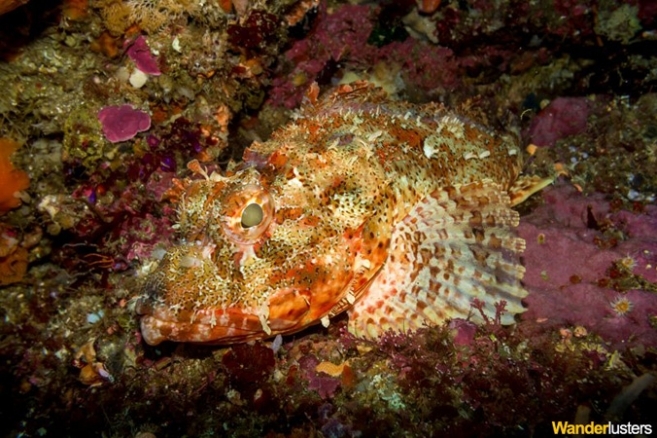 We found the staff to be incredibly friendly and knowledgeable and would recommend their weekend liveaboard to other divers considering a trip to the Poor Knights. Wanderlusters is a new website dedicated to providing ‘Wisdom for Wanderers’. Still in the early stages of development, those eager to travel can search for real world advice and keep up to date with the latest in travel news. The brain child of nomadic Wanderlusters Charli and Ben, they have set up the site to share their experience of long-term travel. Having qualified as PADI Divemasters in 2011 they find any excuse they can to get their heads under the water. Help them spread the wanderlust and follow them on their travels.